My daughter used to loooove yogurt of pretty much any flavor when she was a baby. Straight. out. of. the. carton. These days, not so much. So I sneak it in healthy foods that I make from ( almost) scratch and she eats them up! She loves a good pancake for breakfast ( who doesn't)? and I'm not exactly sure when she started loving the flavor of pumpkin but she does now and I'm not trying to waste time figuring that out. I'm so glad she does though, because I love pumpkin flavored ANYTHING. I hope she'll stick with that flavor for a while or forever! 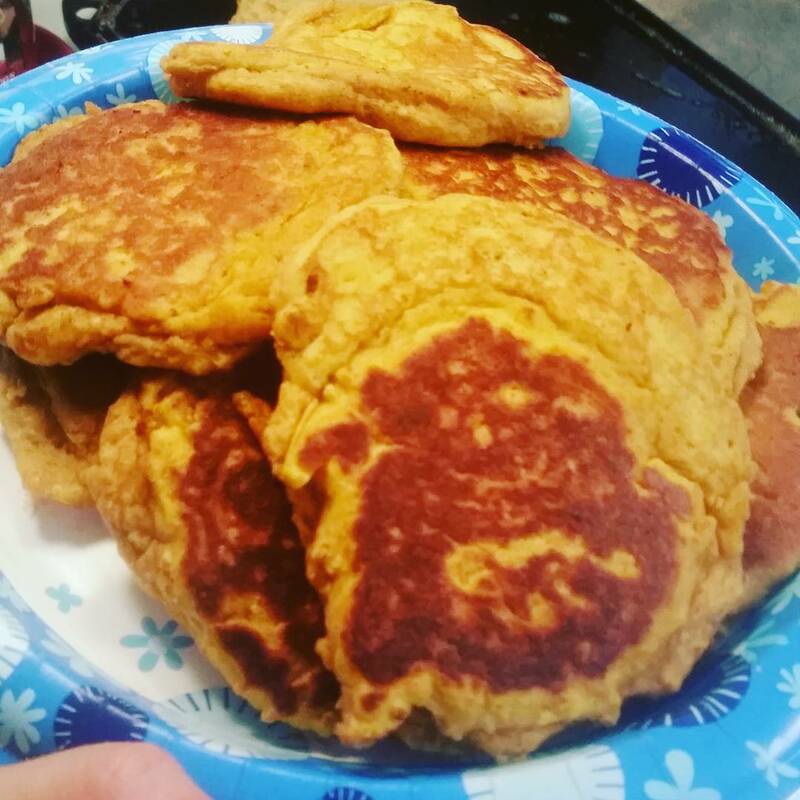 Pumpkin alone is so healthy for you and has tons of fiber! I'm all about homemade recipes from scratch but I'm human and a mom and shortcuts are just necessary sometimes. I love using Bob's Redmill BUTTERMILK WHOLE GRAIN PANCAKE AND WAFFLE MIX. I like to add cinnamon to the batter that it calls for and that's it. Here's the rest of the recipe. Your house will smell incredible and I hope you'll give these a try! Your favorite pancake mix- Bob's red mill says 1 cup but I use 2 cups to make more pancakes. Add any spice you like. Nutmeg, I love using cinnamon. 2 tbsp oil- veggie, canola or coconut works fine. until smooth. Add the wet ingredients to the dry ingredients and mix well until just combined. On a hot griddle pan, spray with non stick cooking spray or melt butter. Scoop pancake mix and cook about 3 minutes on each side. * These are great for the freezer for convenient breakfasts. Wrap in plastic wrap and use when needed. Warm in microwave 1-2 minutes. I always get about 12 pancakes.